Bohuslän (Swedish pronunciation: [ˈbuːhʉːsˌlɛːn] ( listen), Danish/Norwegian: Båhuslen) is a Swedish province in Götaland, on the northernmost part of the country's west coast. It is bordered by Dalsland to the northeast, Västergötland to the southeast, the Skagerrak arm of the North Sea to the west, and the county of Østfold, in Norway, to the north. Bohuslän is named after the medieval Norwegian castle of Bohus. Under the name Baahuslen, it was a Norwegian county from the Norwegian conquest of the region from the Geats and subsequent unification of the country in the 870s until the Treaty of Roskilde in 1658, when the union of Denmark-Norway was forced to cede this county, as well as Skåneland (part of Denmark proper) to Sweden. As of 31 December 2016[update], the number of inhabitants was 299,087, giving a population density of 68 inhabitants per square kilometre (180/sq mi). The provinces of Sweden serve no administrative function. Instead, that function is served by the counties of Sweden. For centuries, the administrative county for Bohuslän was the Gothenburg and Bohus County, and as its name implies it consisted of the entire Bohuslän province together with the city Gothenburg. In 1998, some Swedish counties were merged to reduce administration costs, and Gothenburg and Bohus County were therefore merged into the new, much larger Västra Götaland County. Bohuslän was granted its arms at the time of the funeral for Charles X Gustav of Sweden in 1660. It was identical to the arms of the Town of Kungälv. In 1962 the higher claim of the town was established and a variation for the arms of the county was introduced. The coat of arms is surmounted by a ducal coronet. Blazon: 'Argent, a Castle embattled Gules with one embattled Tower of the same and two doors Or hinged Sable between a Sword point upwards and Lion rampant holding the Tower both Azure langued and armed Or." The geography is distinguished by the rocky coast, bordering an archipelago: there are about 3,000 islands and 5,000 islets (skerries). These make up the northern part of the Gothenburg archipelago, Sweden's second largest after Stockholm archipelago. In old days, the seascape was renowned for its many reefs and sunken rocks which caused many shipwrecks. Two of the largest islands, Orust and Tjörn, constitute their own municipalities. Both islands have a distinctive culture and history. However, the rocky terrain cannot be said to be mountainous: the highest point is Björnepiken at 224 meters. Sweden's only threshold fjord, Gullmarn or Gullmarsfjorden, is located near Lysekil. It is 25 kilometres (16 mi) long and 1 to 3 kilometres (0.62 to 1.86 mi) wide with a maximum depth of 118.5 metres (389 ft). The fjord is home to unique marine life. Bohuslän's coastline was ranked 7th among the world's last great wilderness areas by CNN Travel. Most of the coast is made up by Bohus granite formed in the aftermath of the Sveconorwegian orogeny. In detail these granites have been eroded as to contain abundant small rock basins, some of them filled with clay and silt of combined glacial and marine origin. The coast of Bohuslän is a joint valley landscape. Studies of denudation chronology suggest Bohuslän lies at the westernmost reaches of the Sub-Cambrian peneplain, however there is some uncerntainty on whether the hilltops are remnants of the peneplain. Rather than Sub-cambrian most of the province is made up of a relief unit known as the Sub-Mesozoic hilly peneplain. Their central areas are now non-administrative urban areas. 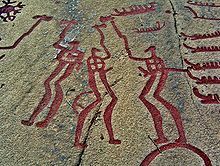 During the 2nd millennium BCE, the Nordic Bronze Age began (c. 1700–500 BCE), including rock art such as the examples found throughout Bohuslän. During the Migration Period (300–700 CE) and the Viking Age (700–1000 CE), the area was part of Viken, and was actually known as two entities: Rånrike in the north and Elfsyssel in the south. It has been claimed that King Harald Fairhair made it part of the unified Norway in about 872, but contemporary sources give rise to doubt that Harald actually ever held the Viken area properly. The earliest proof of Båhus lands being in Norway's hands is from the 11th century. Båhuslen belonged to Denmark-Norway until it was ceded to Sweden in the Treaty of Roskilde in 1658. The fortress of Carlsten was built in Marstrand during the 17th century. For a period, Marstrand was also a free port (porto Franco), with a free religious practice and, as such, home to the only synagogue in Sweden at the time. Before the large scale fishing of herring started, Bohuslän had a considerable forest cover. Timber was once the largest export product and main source of income in Bohuslän. But with the increased importance of fishing, more wood was needed as construction material for houses and boats, and as fuel for herring oil boilers (trankokerier). Deforestation during the 19th century gave rise to today's rugged, rocky landscape. In Bohuslän a variety of the Götaland dialect of Swedish is spoken. The province was a part of Norway until 1658 as mentioned above. Traces of Norwegian remain in the dialect. 'Bohuslän', literally means the 'Fief of Bohus', referring to Bohus Fortress and län. The Nordic Bronze Age (c. 1700–500 BCE) produced rock art showing scenes from the daily life and religious rituals, such as the examples found in Bohuslän. The rock art at Tanum, possibly made earlier, c. 2,500 to 3,000 years ago, have been entered as a site in the UNESCO World heritage program. Rock carvings can be found scattered throughout Bohuslän. The carvings portray the life of an agricultural society with images of daily life, with human figures, religious rituals, ships, circular objects, soles, animals, and fertility figures (e.g. phalluses); and the creation of shallow bowls. Despite the non-administrative status of Bohuslän, some historical functions still remain with football being administered by Bohusläns Fotbollförbund. People from Bohuslän are known as bohusläningar. ^ a b "Folkmängd i landskapen den 31 december 2016" (in Swedish). Statistics Sweden. 2017-03-21. Retrieved 2017-11-25. ^ Reddy, Jini (2013-03-06). "10 of the world's last great wilderness areas". CNN. Retrieved 2013-05-04. ^ Eliasson, Thomas; Schöberg, Hans (1991). "U-Pb dating of the post-kinematic Sveconorwegian (Grenvillian) Bohus granite, SW Sweden: evidence of restitic zircon" (PDF). Precambrian Research. 51: 337–350. ^ Johansson, Magnus; Migon, Piotr; Olvmo, Mats (2001). "Development of joint-controlled rock basins in Bohus granite, SW Sweden". Geomorphology. 40: 145–161. ^ Lidmar-Bergströrm, Karna (1995). "Relief and saprolites through time on the Baltic Shield". Geomorphology. Elsevier. 12: 45–61. ^ Green, Paul F.; Lidmar-Bergström, Karna; Japsen, Peter; Bonow, Johan M.; Chalmers, James A. (2013). "Stratigraphic landscape analysis, thermochronology and the episodic development of elevated, passive continental margins". Geological Survey of Denmark and Greenland Bulletin. 30: 18. Retrieved 30 April 2015. ^ Lidmar-Bergström, Karna (1993). "Denudation surfaces and tectonics in the southernmost part of the Baltic Shield". Precambrian Research. 64: 337–345. ^ Lidmar-Bergström, Karna; Olvmo, Mats; Bonow, Johan M. (2017). "The South Swedish Dome: a key structure for identification of peneplains and conclusions on Phanerozoic tectonics of an ancient shield". GFF. article Bohuslän from Nordisk familjebok (1905). In Swedish. Wikimedia Commons has media related to Bohuslän.